The Eastern resurgence led by China and India permeates several dimensions, industries and regions. From increasingly mighty super conglomerates to international trade pervasiveness, the Chinese and Indians are essentially omnipresent in the world’s competitive environment, and they are challenging Western powers. Financial markets are particularly suitable for analyzing the Chinese supremacy advance. 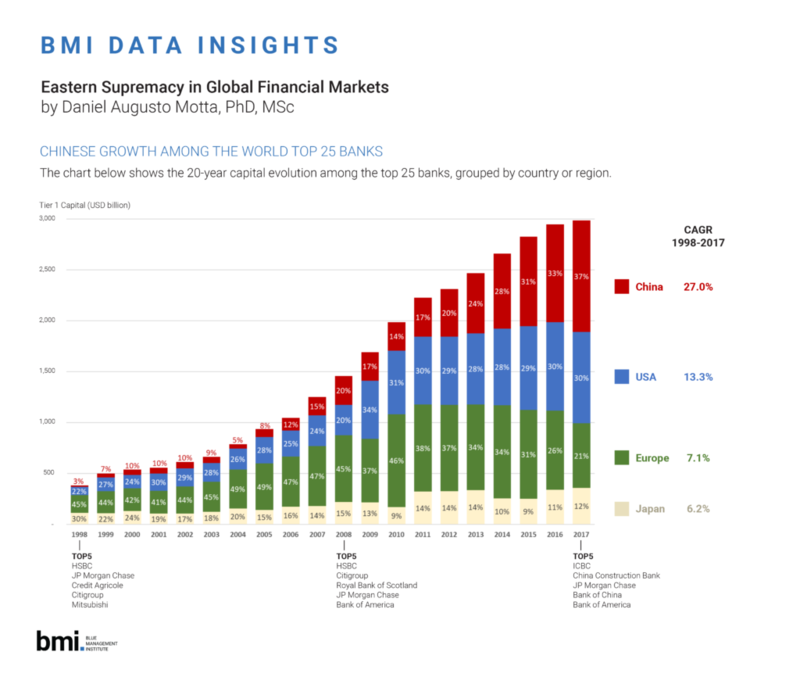 Considering the evolution of the top 25 global banks in the last 20 years, we notice a remarkable growth rate among Chinese banks —27% yearly— more than twice the world average, 11.5% yearly. Chinese share of the aggregate capital in these top 25 banks jumped from 3% to 37% between 1998 and 2017, to the detriment mainly of Japanese and European banks. Despite criticism of insufficient soundness of Chinese banks balance sheets —especially related to provisions for Public Sector credit default— it is impossible to disregard the entrepreneurial spur of banks such as ICBC and CCB. The crucial next step in this race might take place precisely in Latin America. Natural resources, energy and food seem to be critical industries in Chinese global expansion planning, and Latin America has plenty of all of it. USA and EU will be increasingly challenged both in supply and demand sides of markets. The growth in China’s economic engagement with the LATAM region in the past decade is impressive. Trade has increased by nearly 2,000% since 2000, leveraged by bilateral free trade agreements with countries such as Peru and Chile. China has also made billions of dollars in loan commitments across LATAM countries. And apart from the decline of the commodities boom, the Chinese government and private sector are not leaving anytime soon. The next focus of Chinese interest in the region will probably switch from trade to investment. Since 2012, China has already become the third global source of FDI, after only the United States and Japan. China is also increasing its financing presence. From 2005 to 2014, loan commitments totaled more than $118 billion. And the critical question here is still on whether China is the right long-term partner or just a short-term predator. Chinese and Indian growing presence doesn’t have to be a zero-sum game for LATAM countries. First, offers a growing opportunity for LATAM exporters to these huge Asian markets. Second, these super Asian powers also represent a growing source of financing. Third, the large scope for bilateral cooperation can leverage innovation in the region supported by Chinese and Indian enterprises. Naturally, these potential aggregate gains will be accompanied by some pain in certain industries, companies, and countries that might be negatively affected by the rapid growth of the two Asian gigantic economies. From a Brazilian perspective, personally, I would challenge the rationale of allowing Chinese trading and energy companies to dominate agribusiness and energy industries. Land, food and energy are too sensitive matters for a nation to be controlled by foreign companies.